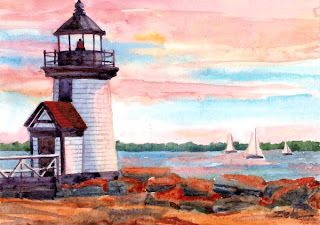 Brant Point on Nantucket is the second oldest lighthouse station in the US after Boston Light. It was established in 1746 at a time when the whaling industry was growing fast. No less than nine different structures were built in sequence on Brant Point to date. Many of those burned or were destroyed by storms. Still functioning today is this lighthouse built in 1901. The white lantern was changed to red in 1933 to distinguish it from house lights nearby. When you take the ferry from the mainland, you will come around Brant Point to visit Nantucket island.